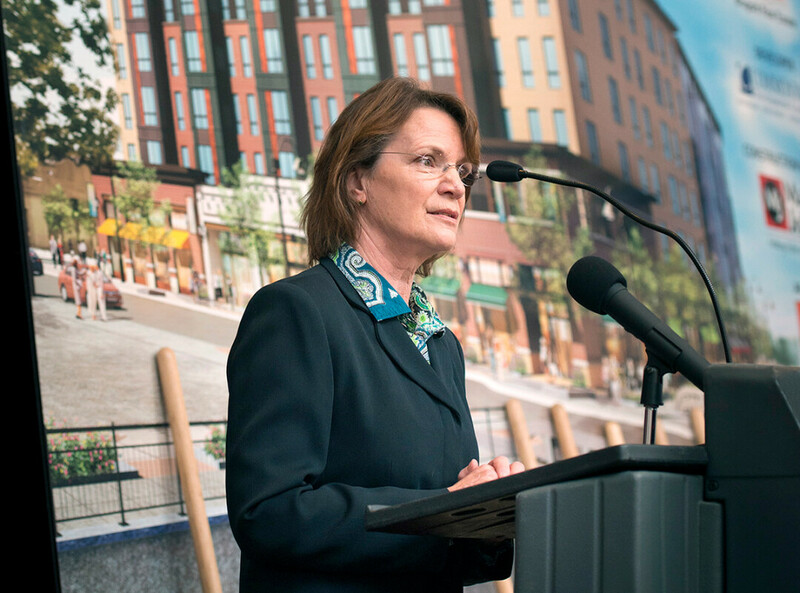 Then-Eau Claire City Council President Kerry Kincaid spoke in November 2014 at a groundbreaking ceremony for the Haymarket Landing, the privately-funded, mixed-used component of the Confluence Project in downtown Eau Claire. Kincaid, who resigned in June, said such public appearances were an important part of her role as council president. In her 25 years in public service, the last nine of them as Eau Claire City Council president, Kerry Kincaid learned that leadership can be both richly rewarding and lonely. As council president, Kincaid not only ran meetings but also served as troubleshooter for city residents and as a de facto city spokesperson. “Of course, one could say no to that, but I didn’t want to, so I started saying yes to everything I was asked to do,” Kincaid said, referring to the countless public appearances she made as Eau Claire’s cheerleader-in-chief. “I learned on my feet to speak about Eau Claire with dignity and passion and intelligence – I hope!” she added with a laugh. Kincaid, who stepped down as City Council president in June, said her story of seeking elective office is a familiar one for many on the local level. In 1993, a friend encouraged her to run for the the Town of Washington Board of Supervisors. She served two terms on the board, then on a variety of public councils and committees, including the City of Eau Claire’s Plan Commission. It was from that position that she first sought a district seat on the Eau Claire City Council in 2003. She lost that race, but was elected to an at-large seat the following year. Until her resignation, she served continuously on the council since 2004, including as council president since 2009. In her resignation announcement, Kincaid listed some of her proudest accomplishments. Chief among them was playing a role in the revitalization of downtown Eau Claire, including the creation of Phoenix Park and the upcoming opening of the Pablo Center at the Confluence. The new arts center is slated to open in September, and although it still faces a funding shortfall, Kincaid is overwhelmingly optimistic that it will succeed. Other accomplishments cited by Kincaid don’t carry the same high profile, but they are still close to her heart. One is the creation of the Public Spirit Fund, a charitable fund managed by the Eau Claire Community Foundation, which was created to help raise money to pay for public needs identified in the city’s 2012 Waterways Plan. Kincaid also helped found Eau Claire PORCH Inc. – the acronym stands for “Progressive Outreach to Our City’s Homeless” – a newly founded nonprofit that helps provide permanent supportive housing to individuals and families living without homes. Another accomplishment was her advocacy for the creation of the position of Eau Clare poet laureate, now known at the city’s writer in residence. Finally, Kincaid said she’s proud to have instilled an expectation of civility on the City Council, both between the council and the public and among council members. In many cases, coming before the council on some matter may be the only interaction a member of the public has with his or her elected representatives, Kincaid noted, and she wanted to ensure that the experience was positive. Kincaid acknowledged that national politics isn’t always a civil affair, but she said there’s still a chance that civility can flourish locally. But will it? “I don’t know,” she answers simply. It was no secret that things had been tense of late on the council. Over the past year, disagreements over council members’ decorum during meetings arose. In particular, Councilwoman Catherine Emmanuelle’s desire to continue to nurse her young child during meetings led to a successful vote last October, supported by Kincaid, to prohibit children from the council dais during meetings. And in the April election, four incumbents who had a total of 36 years of council experience among them were defeated by a slate of newcomers. While she is now out of public office, Kincaid intends to continue her involvement in the community. She serves as president of PORCH, and she’s pursuing a doctorate in leadership from the University of St. Thomas. (Her coursework is finished, but she must still complete her dissertation, which is about the Confluence Project.) Kincaid may find herself teaching in the near future, and she also hopes to study the traits of women in leadership roles.